Travelling Vine Scarf | Domesticated Human Travelling Vine Scarf | Online home of Crystal Flanagan. Knitter, spinner, sewer, weaver, canner, baker. 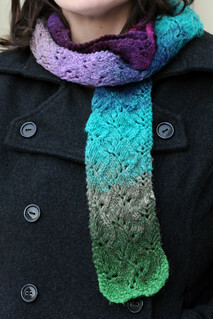 Noro yarn is knit into a skinny scarf with a sweet travelling vine pattern. The green in this yarn inspired the stitch I chose, but I am sure it would look equally pretty with any Noro colours!